THE 2018 Russia World Cup has not kicked off yet drama is unfolding. Shown the door. Spain coach (middle) Julen Lopetegui has been fired by Spanish football federation (RFEF) before the first whistle of Russia WC kick off, for unbecoming behavioral conduct. A coach by the name of Julen Lopetegui has been fired by his employers Spain ahead of their kick off campaign against Portugal on Friday. His contract was to run until 2020. The reason: poor behavioral conduct ie. signing a contract with Spanish outfit Real Madrid yet he had signed to coach the Spanish national side. This sparked outrage among the federation and Spanish fans at the timing of the announcement. This was revealed at today’s media brief by the Spanish football federation (RFEF). But multiple media reports on Wednesday said that RFEF president Luis Rubiales was so angry at Lopetegui’s conduct that he was prepared to fire him immediately. And it happened today, before the WC kick-off. “We have been forced to dispense with the national coach. We wish you the greatest of luck. What you get…will have to do with the work you’ve developed,” said angry Rubiales at the press conference. “I have spoken with the players, and I can guarantee that they will do everything they can with the new coaching staff, we are in a very difficult situation. “I do not feel betrayed because Julen has done a relentless job, but we are forced to move on this because of how things have been done,” Rubiales continued. “He is a professional, but this is not correct and we can’t look the other way. “You can’t do things like that, five minutes before it’s official. “I came from Moscow because this issue is more important, and we had to react. Initially, Lopetegui who was supposed to vacate his position at the end of the WC campaign, has been signed as Real Madrid’s new boss. Would this affect the morale of the players’ on-off the field will see how it pans out? Meanwhile, Egypt head coach Hector Cuper has given an update of the fitness of attacking talisman Mohamed Salah ahead of the 2018 FIFA World Cup. Salah was said to be a major doubt for the tournament after suffering a shoulder injury in the UEFA Champions League final defeat to Real Madrid last month. However, Cuper included the Liverpool superstar in his final 23 man squad despite the questions marks surrounding his potential involvement. Cuper is now hopeful that the 25-year-old can feature in the opening fixture against Uruguay after the Reds man has made steady progress with the Pharaohs medical team. Back in training. Liverpool and Pharaohs star Mohamed Salah hard at training following a shoulder injury. Its unclear whether he will be ready for their opening game as suggested by coach. 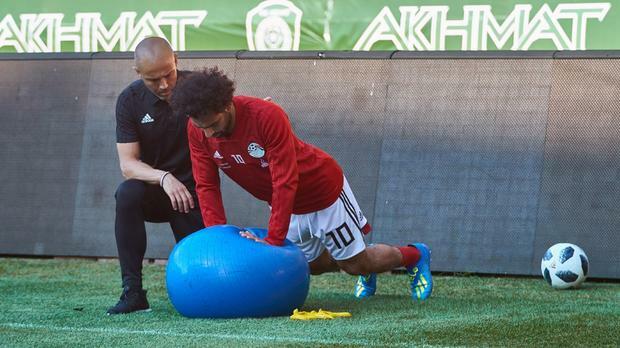 Team director Ihab Lahita was cagey about Salah’s progress, saying there was no guarantee he would play in Egypt’s Group A opener against Uruguay on Friday. Other African teams at the WC are Nigeria, Senegal, Morocco and Tunisia.